REUTERS / President Maduro told supporters to celebrate "anti-imperialism day"
Venezuela's President Nicolás Maduro has praised the armed forces for staying loyal to him and defeating a "coup" led by the US and opposition leader Juan Guaidó. During a rally, Mr Maduro also blamed Venezuela's widespread power cuts on "cyber attacks" by the opposition. Speaking outside the Miraflores presidential palace, Mr Maduro referred to Mr Guaidó as "a clown and a puppet" of the US. 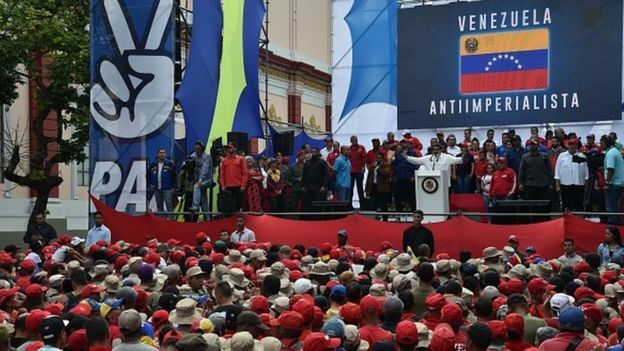 President Maduro has repeatedly accused Mr Guaidó of trying to mount a coup against him with the help of "US imperialists"
Addressing the rally, Mr Guaidó announced he would embark on a tour of the country and summon all his supporters to attend a mass protest in Caracas "very soon". President Maduro has repeatedly accused Mr Guaidó of trying to mount a coup against him with the help of "US imperialists". At the end of what had been one of Venezuela's more fraught days of the recent period of political upheaval, the lights went out again. Caracas was plunged back into darkness with the vast majority of the city still without power. Issues are being reported from other cities elsewhere in the country too. Yet that is unlikely to happen overnight, even with widespread blackouts across the country. 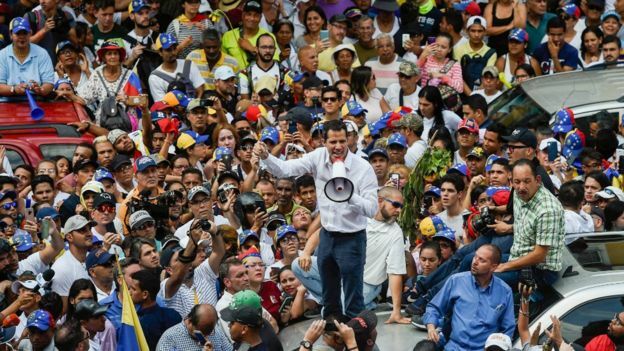 For now, Mr Guaidó intends to travel the nation to drum up support and then hold another huge march in Caracas. Ahead may lie more demonstrations, more attempts to bring in humanitarian aid against the government's will, more potential for clashes. The widespread power cuts since Thursday have reportedly been caused by problems at the Guri hydroelectric plant in Bolivar state - one of the largest such facilities in Latin America.